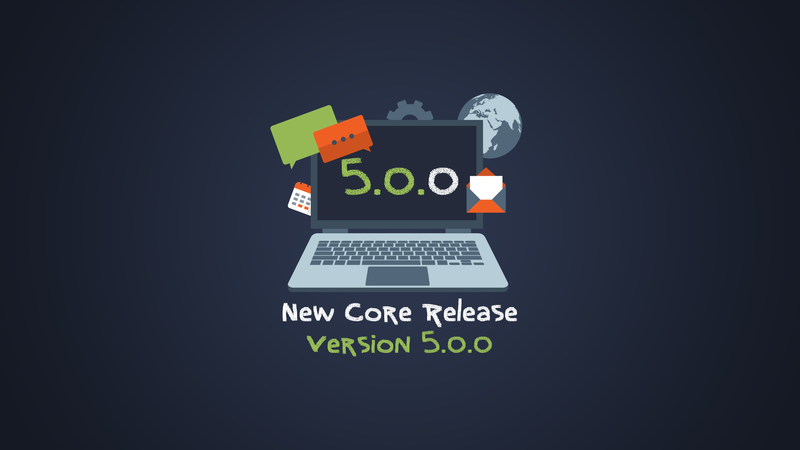 Version 5.0 of Awesome Support was pushed to the WordPress.org repository on March 30th - one day before the end of the first quarter. Our goal was to get this out the door by the end of the first quarter - looks like we barely squeaked it in! We focused a lot on tiny usability changes to make the plugin a little easier to use. We did this by moving some things around and bringing them closer to where you are on the page. By closing up vertical space we eliminated a fair amount of scrolling especially for those users that have many add-ons. We cut the number of metaboxes that would show up on the right hand side of the page by at least 30%. Here is a list of most of the changes but if you need an exhaustive list please check out the changelog directly on wordpress.org. 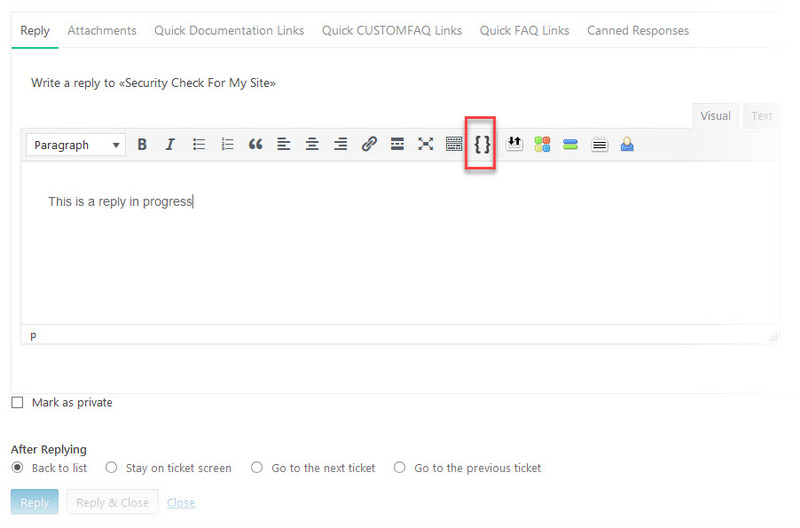 We Introduced an icon toolbar at the top of the individual ticket view. We removed the ticket URL that was under the ticket title. This helps to reduce the amount of vertical space taken. You can still use an icon in new toolbar to view it if you need it. We moved some of the metaboxes closer to the ticket as tabs. In particular you no longer have to scroll down to view custom fields - they are now right next to the ticket info more easily accessible via a tab. Hovering over a reply will show icons instead of links. This helps when you have a lot of add-ons installed where the links were just messy. Attachments, FAQ and similar tabs are now right next to the reply in tabs so you don't have to scroll down to get to them. If you choose either option to take the changes for test drive, we would love to get your feedback before the final release! The core plugin will include just three icons in the new toolbar. However, additional icons will be inserted by premium add-ons. Certain metaboxes have been moved closer to the ticket. 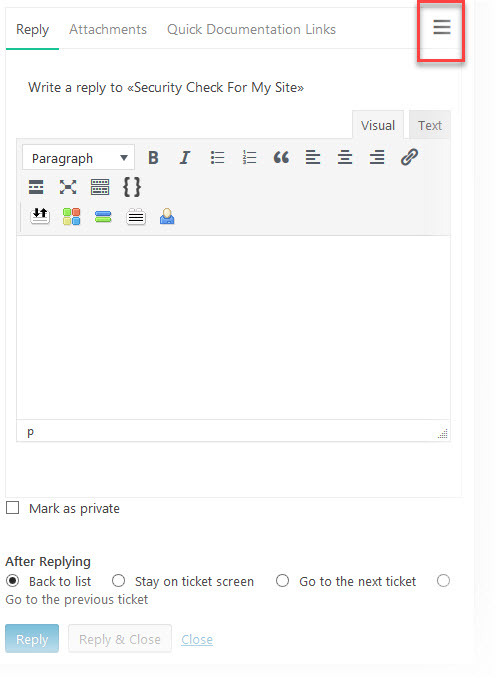 So the opening post of the ticket itself is in one tab and custom fields, time tracking, statistics and certain other tabs from premium add-ons will be on the same tab level as the opening ticket post. This prevents agents from having to do extensive scrolling to locate key data about the ticket. The custom fields tab is now three columns wide on a regular computer screen, 2 columns on a tablet and 1 column on a small device such as a phone. Currently, when an agent hovers over a reply they see a set of links that allow them to perform actions on that reply. As the number of add-ons have increased, the length of the links row grew to be rather large and words and letters started to overlap. Those links are now replaced with icons and tool-tips. The same logic applied to this area as the opening ticket post area - we wanted to move common actions closer to where the agent's cursor might be located instead of requiring scrolling vertically to find these items. In particular, the REPLY area is just another tab as is the attachments function. Key add-ons such as FAQ and CANNED RESPONSES also make use of the new tabs in this area. The down-side of this change is that it does require an extra mouse click to get to the new tabs. However, we still felt that was a much smaller action that having to use the mouse to scroll down. 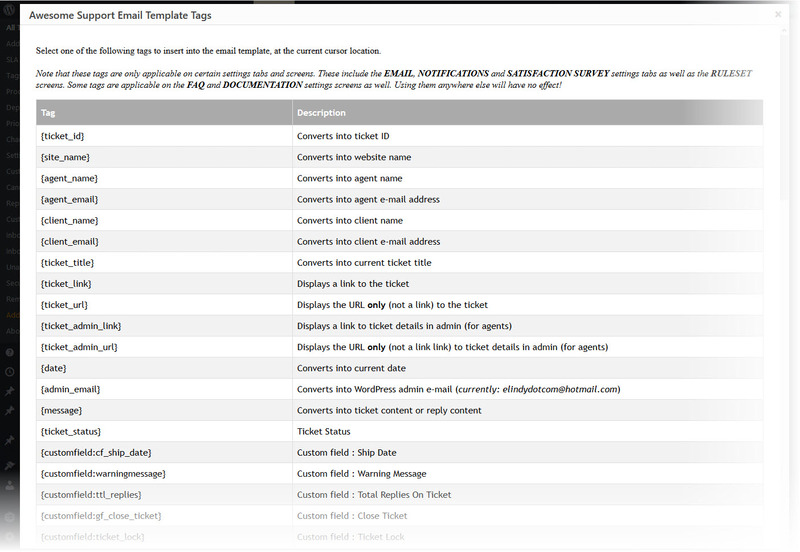 We added the ability to click an icon in the editor to pop up a list of email template tags. This is a lot easier than having to remember them or looking them up in the help area. The image on the icon is two curly braces (since email template tags are enclosed in curly braces). 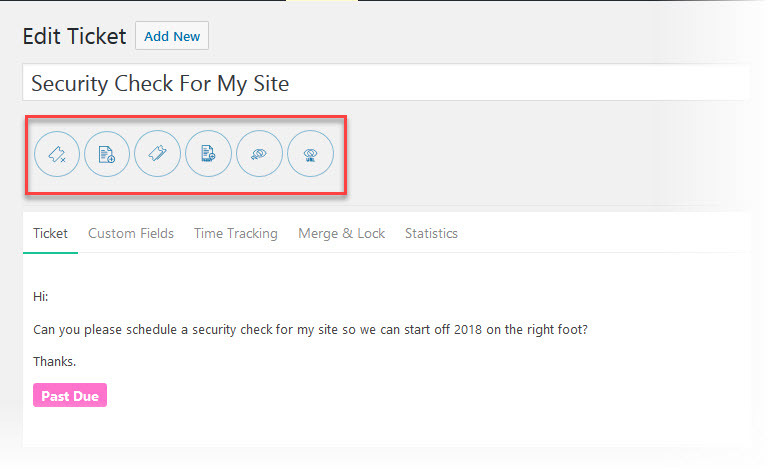 When the icon is clicked, here is what the popup looks like - simply click on an item and the email template tag will be inserted at the current cursor location. While we do have a premium WooCommerce add-on and we already have a product syncing function in the free version of Awesome Support, we decided to add yet another free integration point. 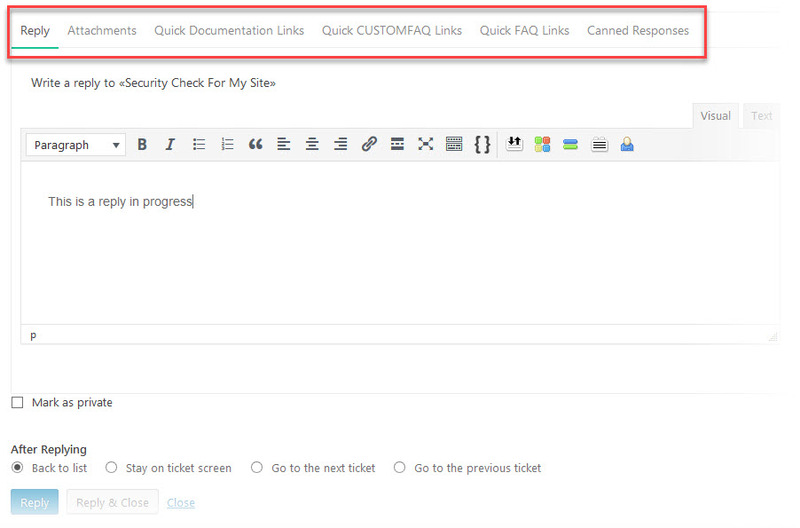 Now, you can get direct links to the ticket pages from the WooCommerce MY ACCOUNT page. On smaller devices, the MORE option at the end of a tab row is now replaced with the ubiquitous HAMBURGER ICON. 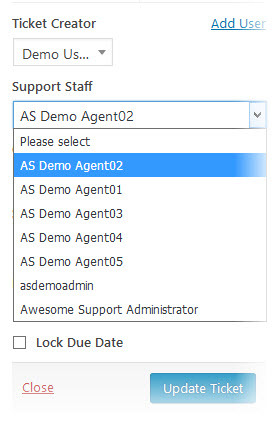 In prior versions, the support agent/staff drop-down was a SELECT2 box. This meant that the first three characters of the agent name had to be entered before an agent could be selected. For most operations, the list of agents is small so it made sense to replace this with a regular drop-down select box that showed all agents right away. You can still change this back to a SELECT2 box in TICKETS->SETTINGS->GENERAL. We have added a bunch of new registration options - so much so that we had to create an entirely new configuration tab called, well, REGISTRATION (accessible via TICKETS->SETTINGS->REGISTRATION). When you allow users to register on your site for support they would normally get the default WordPress new user registration emails. And, another email would be sent to the Administrator. Now, you can control who receives a notification or if notifications are even sent at all. You still can't control the contents of the notifications though since they are the default WordPress new user notifications. Note that the default will still be a concatenation of the First and Last name unless the admin chooses another option. 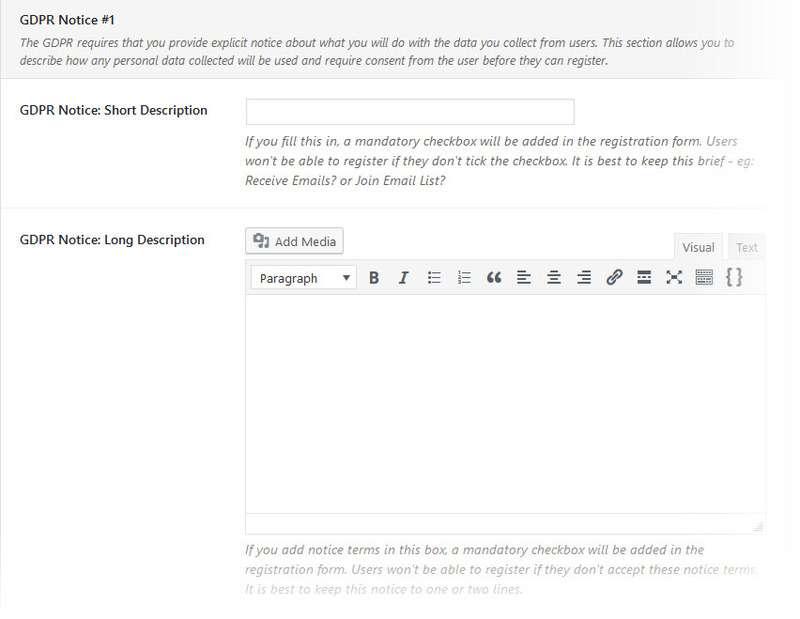 You can now add a description to each registration field which will show up underneath the field. You can use these to indicate how the data will be used, helping you to meet your GDPR obligations. Awesome Support has always had the ability to force users to accept your terms and conditions. However, for many users this is no longer sufficient under the GDPR requirements. Now, you must explicitly get consent for certain kinds of data storage and use. For these cases, we offer up to three new check-boxes - you can configure each of them to show a short description and a long description. In prior versions, some of our private log files would sit directly under the plugins/awesome-support folder. Now, the admin can change that location under TICKETS->SETTINGS->ADVANCED. 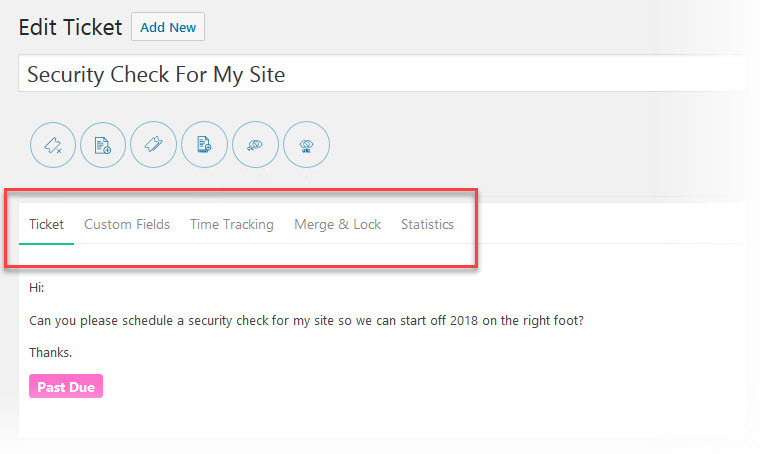 You can now control which page a user is directed to after they click the Awesome Support logout button. Generally this would redirect your users back to your home page or maybe your documentation pages or even some sort of offer page. Generally, when a user enters a new ticket they are taken to that new ticket after clicking the SUBMIT button. Now, the admin can specify where the user should be redirected to. For example they could be redirected to a thank you page, an FAQ page or a SELF HELP page. There are new options that control how the Awesome Support Importer will work in tandem with Awesome Support. 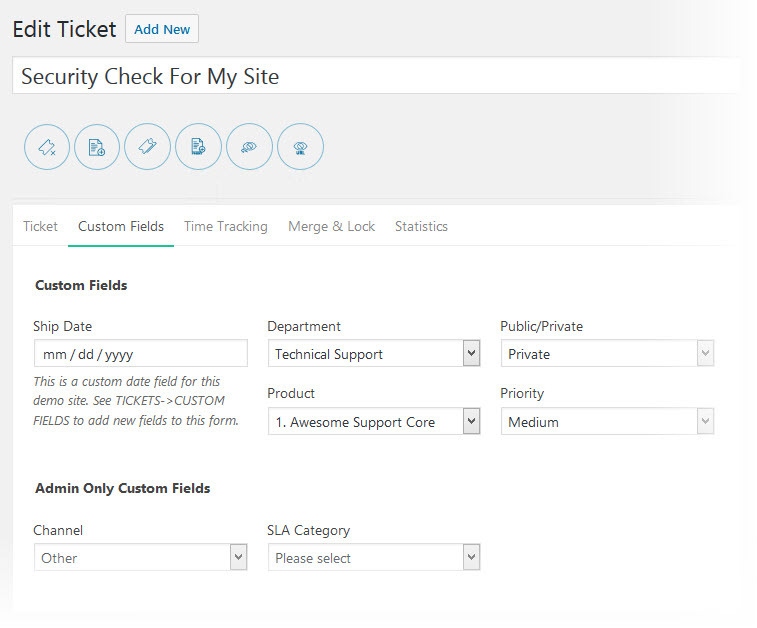 (The Awesome Support Importer allows you to import your tickets from Zendesk, Helpscout and Ticksy). In prior versions of Awesome Support you could set a SLUG for products that was different from the default 'product'. But you had to do this in wp-config. Now, you can set it directly in the SETTINGS screen. This helps with Multisite installs of WordPress where each site might want to use a different slug. The ticket slug is no longer always visible under the ticket title. Instead, you can use one of the new tool bar icons to view it. We added new attributes for custom fields to allow for pre and post do_action declarations. This is especially useful if you want to add additional html before or after a field. 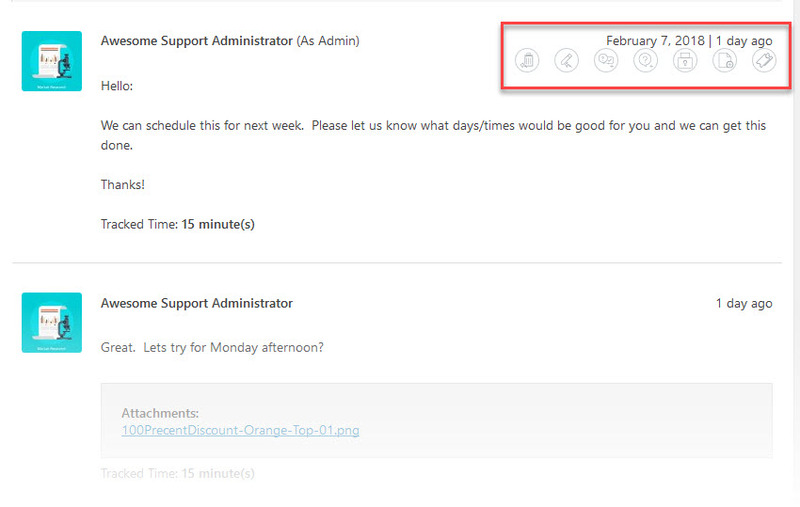 We added an option to show/hide the extended date-time information when hovering on replies. The default is now to HIDE the extended date information. We added an option to hide closed tickets on the front-end. Some users have operations with many closed tickets where viewing them on the front-end is unnecessary. We added options to control which roles cannot view certain tabs such as the ADDITIONAL INTERESTED PARTIES tab. We added options to control which roles cannot view certain metaboxes such as the TAGS metabox. ***possible breaking change*** The submission form was redone to make all fields being used part of the global custom fields array. This helps with sorting the fields. A new version of Eric Mann's wp-session-manager framework is now included which uses custom tables to hold the session data. For larger volume sites this is much more efficient! Added function to check to see if a notice is a license notice and suppress it if we're running in SAAS mode. This only works for those add-ons that use our core library functions so older add-ons that don't will still show license notices. We Added a new base extension class for use by add-ons. Eventually all add-ons will be converted to use this new class. Tickets were not going to INPROCESS under certain circumstances. If the first agent reply on the ticket didn't change the status (eg: when using smart replies), it would never get changed on a normal agent reply in admin. Now it does. WooCommerce 3.x styles stepped all over some of AS styles on AS pages. Whew - that's a lot of changes. What do you want to see next? Drop us a note and let us know where the gaps are in your operations - we would love to fill them with Awesome new functionality.